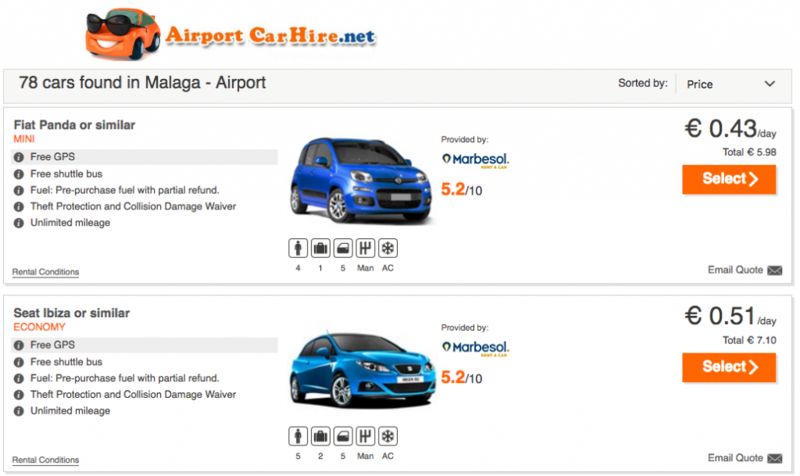 Are you looking for the best car hire deals in Spain? 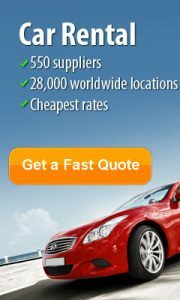 Well just when you thought car hire prices in Spain could not possibly get any cheaper, we have done it again. June special offer Fiat Panda for as little as .43 cents a day. Yes you heard it right rent a car in Malaga Airport for .43 cents a day which must be the best car hire deals in Spain, or if you want to splash out a little extra go for a Seat Ibiza for only .53 cents per day . That is less then €6 for a 2 week rental and includes GPS. The only additional extra is fuel. Your car will be provided with a full tank of fuel for which you will need to leave a deposit at the rental desk. Upon return of the car you will be refunded for the unused fuel and charged an admin fee of EUR 40.00. Even allowing for the €40 admin fee for fuel, it is incredible value and you will benefit further if your rental is for 3 weeks, as you only pay one admin fee per rental. One week rental will cost €43, Two weeks will be €46, and three weeks will only cost €49 in the month of June at Malaga airport. There are no extra fees or charges everything else is optional, such as child seats, or extra driver. There is an excess of €1,000 on the insurance but if you take out an annual multitrip excess reimbursement insurance from Insurance 4 car hire it will cover any excess damage to all cars you hire within a 12 month period. This of course is optional and if you prefer you can rent the car with out excess reimbursement insurance but you will be responsible for the first €1,000 euros. A block will be placed on your credit card to cover this. It will be lifted a few days after you return the car without damage. Other cars on offer in June are the Mercedes Citan which will be a guaranteed model at .92 cents per day or the 5 seat Renault Kangoo or similar at .85 cents per day. The majority of the fleet will be this years model. This is a limited offer and when there gone they are gone so book now to lock in the price. We offer Free Amendmentents, Free Cancelllation if you cancel 24 hours before pickup and No Credit Card Fees. You have nothing to loose so book now. Always Get the Lowest Price with our lowest price switch. Book early and recheck the price every once in a while. If the price drops, simply log in and amend your booking. Choose the same car at the lower price and switch. The difference in the price will be automatically credited to you credit card immediately, is as simple as that.